The Medway Self-Propelled Commode is lightweight commode which comes with the benefit of allowing independent use if necessary. For additional safety to the user, brakes are fitted to the castors. It's easy to manoeuvre in and out of the chair, as the arms flip back, as well as the footrests, and it is height adjustable, so creating more room for movement. This commode can be used in a shower cubicle, and can be used as a commode, or wheeled over a standard toilet bowl if needs be, so making it much more diverse than a standard commode would be. It is fitted with a square bowl as standard, though this can be removed if the user wishes to use a standard toilet. For all other times, there is a seat insert, providing both comfort and discretion. Castors have brakes for additional safety. Footrests swing away for easy entry and can also be detached. Armrests can be flipped back for easy side transfer. Usable in a shower cubicle. 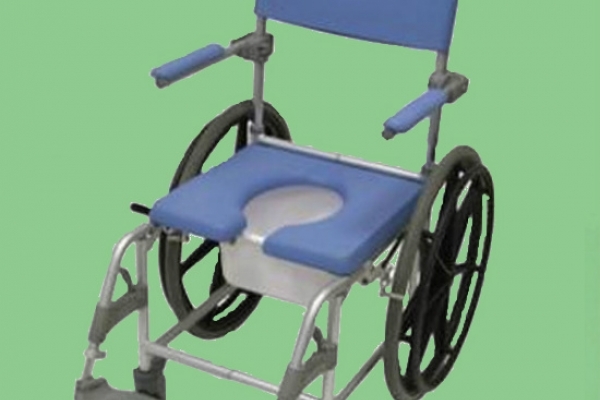 Can be wheeled over a standard toilet bowl. Seat Insert for additional comfort. Square bowl fitted as standard.